Orange You Glad I Got Out of Bed? Nina calls it my “O Cake”. 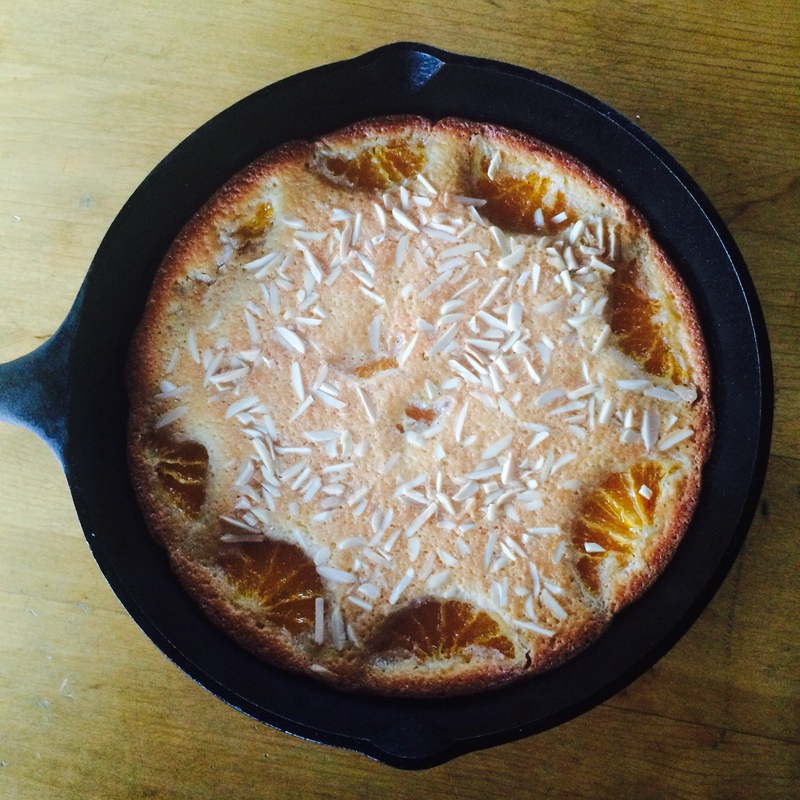 Oranges and Almonds in a skillet never tasted so damn good. Grease a 9” cast iron skillet (or round cake pan) with butter. Preheat the oven to 350°F. In a medium bowl, whisk together the eggs, sugar, orange zest, and juice until well blended. Add the salt, vanilla, and almond extract; whisk until well combined. Add the flour to the bowl, and gently stir until well combined. Fold in the melted butter until a smooth batter forms. Pour the batter into greased skillet and smooth top with the spatula. Place sliced oranges on top of batter and sprinkle almonds in between orange slices. Bake at 350°F until top is golden and edges are slightly crisp. Allow cake to cool for 5 minutes before slicing or transferring to a serving plate. Garnish with a light dusting of powdered sugar; serve warm or at room temperature. In a medium skillet, combine the water and sugar and bring to a boil. Add the orange slices and cook over moderate heat, turning them occasionally, until the liquid is reduced to a thin syrup and the orange slices are translucent, about 20 minutes. Reduce the heat to moderately low and simmer until the syrup is thick and the slices are tender but still intact, turning occasionally, about 10 minutes. Transfer the orange slices to a rack to cool. Coat with sugar and store in refrigerator for up to two weeks. Reserve the syrup in refrigerator for another use. It will last about two weeks as well.